A genuine wild individual from Sumatra (see 'Notes'). 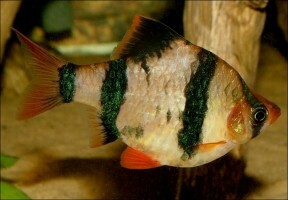 Wild-collected adult male specimen from the U.K. aquarium trade. Wild-collected adult female from the U.K. aquarium trade. 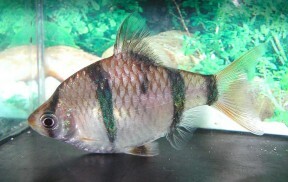 Adult male specimen from the Danish aquarium trade; commercial strain. Male; 'black marble' ornamental strain. Adult male; 'moss' or 'green' ornamental strain. 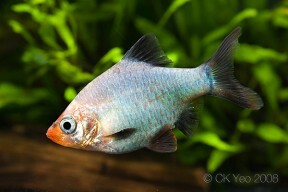 Specimen from the Singapore aquarium trade; commercial 'platinum' strain. Adult pair, male at front; commercial albino strain. Adult female; commercial strain, with typically deformed body shape. 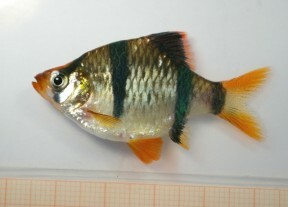 Specimen from the Bosnia-Herzegovina aquarium trade; commercial strain. tetrazona: from the Ancient Greek τέτταρες (téttares), meaning ‘four’, and ζώνη (zṓnē), in reference to this species’ colour pattern which comprises four dark vertical bars. Probably endemic to central and southern Sumatra, with records from Borneo corresponding to congeners. Additional records exist from the Indragiri, Batang Hari, and Musi river systems in Riau, Jambi, and South Sumatra provinces, respectively. Type locality is ‘Lahat, Palembang Province, Sumatra, Indonesia’ which corresponds to modern-day Lahat Regency in Sumatera Selatan (South Sumatra) province. Feral populations derived from aquarium stock also exist in a number of other territories including Singapore, Australia, the United States, Colombia, and Suriname. Unconfirmed, but Bornean congeners display a preference for forest streams and tributaries containing relatively clear water and substrates of sand and rocks/pebbles of varying sizes (M. Lo, pers. comm; M. Ford pers. obv.). Base dimensions of 80 ∗ 30 cm or equivalent should be the smallest considered. pH: 5.0 – 8.0; commercial strains tend to be adaptable, but acidic to neutral conditions are recommended for wild stock. Hardness: 18 – 357 ppm. Wild fish will do best towards the lower end of this range. 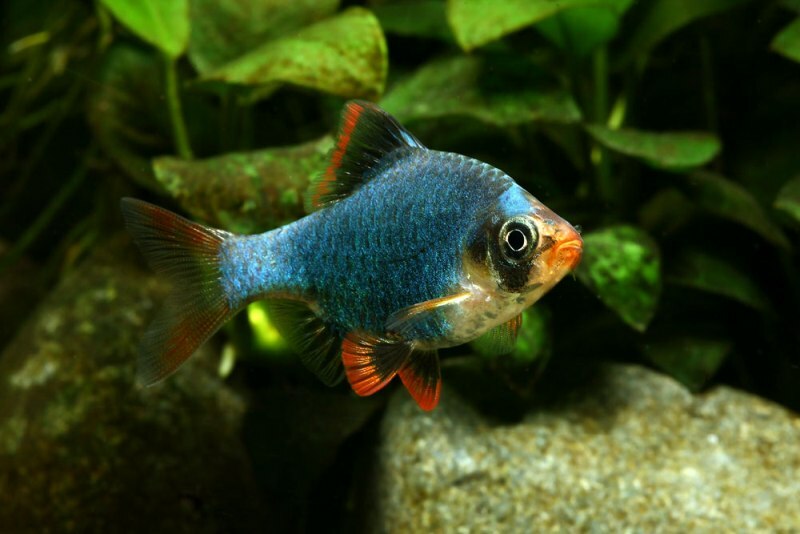 In the aquarium it is easily-fed but the best condition and colours offer regular meals of small live and frozen foods such as chironomid larvae (bloodworm), Daphnia, and Artemia, alongside good quality dried flakes and granules, at least some of which should include additional plant content. This species is notoriously aggressive with a reputation for biting the fins of other fishes, although this behaviour only seems to be pronounced when insufficient numbers are purchased or space is limited. That said, it is relatively boisterous and does not make an ideal companion for timid, slow-moving, or long-finned species such as many livebearers, cichlids, and anabantoids. Robust fishes inhabiting similar biotopes in nature, especially comparably-sized, pelagic cyprinids perhaps constitute the best choices but other options include balitorid, cobitid, and nemacheilid loaches as well as benthic cyprinids such as Crossocheilus or Garra species. If geography is not an issue many rainbowfishes and tetras are also suitable, but be sure to research your choices thoroughly before purchase. It is a gregarious species forming loose hierarchies, with rival males continually battling with each other for female attention and hierarchical position within the group. A group of at least 8-10 specimens should be considered the minimum purchase since this increases the likelihood that the fish will be distracted by each other rather than their tankmates and will result in a more natural-looking display. Males will also show better colouration in the presence of conspecific rivals. 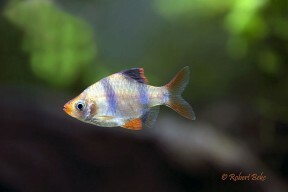 Adult males tend to be smaller, slimmer, and possess a more intense colour pattern than females. Like most small cyprinids Puntigrus spp. are egg-scattering free spawners exhibiting no parental care. When in good condition they will spawn often, and in a mature aquarium it is possible that small numbers of fry may start to appear without intervention. If you wish to maximise yield a more controlled approach is required, however. P. tetrazona is traditionally considered to be among the most ubiquitous species available in the aquarium trade. 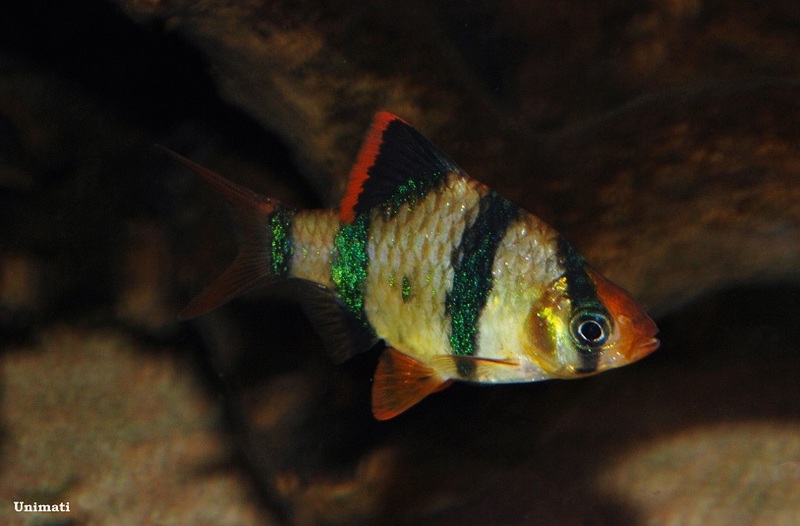 Wild examples are rarely traded, however, and there exists ongoing confusion as to the identity of the commercially-produced ‘aquarium’ tiger barb. A number of selectively-bred, ornamental strains are available. The albino, ‘green’ (aka ‘moss’), and ‘golden’ (leucistic) variants are particularly popular, but there also exist ‘platinum’, ‘blushing’, ‘black marble’, and ‘coral red’ strains. These have no additional requirements and care is as described above. Unfortunately, many of the fish traded today are genetically weak, prone to disease, or develop physical deformities due to excessive inbreeding. This species has also been subjected to the abhorrent practice of artificial dying, a cruel and undoubtedly painful process which involves injecting the fish repeatedly with coloured dyes. P. tetrazona is distinguished from congeners by the following combination of characters: lateral line incomplete; 12 circumpeduncular scales; 19-21+2 scales in the lateral row; dorsal fin mostly black with paler outer margin; pelvic fins black in middle, hyaline at base and tip; dark body bars relatively wide, covering up to 2.5 scales. The genus Puntigrus was raised by Kottelat (2013) in order to accommodate a group of species formerly referred to as the ‘Puntius tetrazona group’. Other members are P. anchisporus, P. navjotsodhii, P. pulcher, and P. partipentazona, of which the first three are native to western, central, and eastern Borneo, respectively, and the latter to Indochina. The genus Puntius was previously viewed as a polyphyletic catch-all containing over 100 species, but this situation has been largely resolved since the turn of the century. Puntigrus tetrazona is referred to as Puntius tetrazona, Systomus tetrazona, or Capoeta tetrazona in older literature. Nalezingen op de vischfauna van Sumatra. Visschen van Lahat en Sibogha. The correct name is Barbus anchisporus. 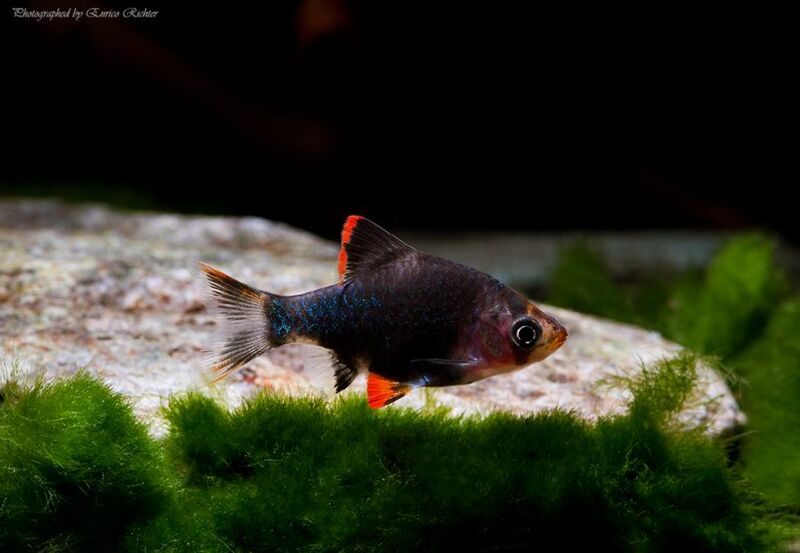 Tetrazona has black fins, and is almost unavailible in the aquarium trade. For Polish speaking here’s the article. As far as I’ve been able to work out this species is currently of uncertain generic placement as per reference #7 above, while Barbus tetrazona is a synonym of Puntius rhomboocellatus Koumans 1940.
and some info that were published later, like the Vaillant statement, that there was a mistake in his original description. Ok, read the article with the help of John (Google), but I don’t understand the author’s conclusions? Could you summarise them please? There is a second article to come. Basicly the whole problem exists in the books since Vaillant misinterpreted his own work, and made some mistakes. Since then almost every information about P. tetrazona had incorrect information. 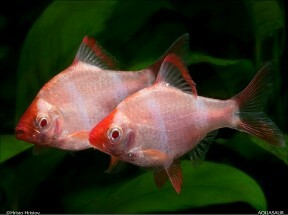 The article was written to show the errors in Polish books about the aquarium hobby. From what I know writer (who I know as “Killifish” from the cichlidae forum) is currently in possesion of the actual P. tetrazona and is trying to breed them. The following article should be about them specificaly. Summary is to be written before the end of the month. I could give him Your email, if You want. P. tetrazona was described by Bleeker although Vaillant did describe P. anchisporus, but I’m unable to comment further on the article without the requested summary. 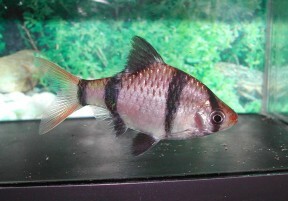 I think we can safely say that the tiger barb in not P. tetrazona. I’ve even looked at the types, and can confirm this. The real question is, however, what it really is. 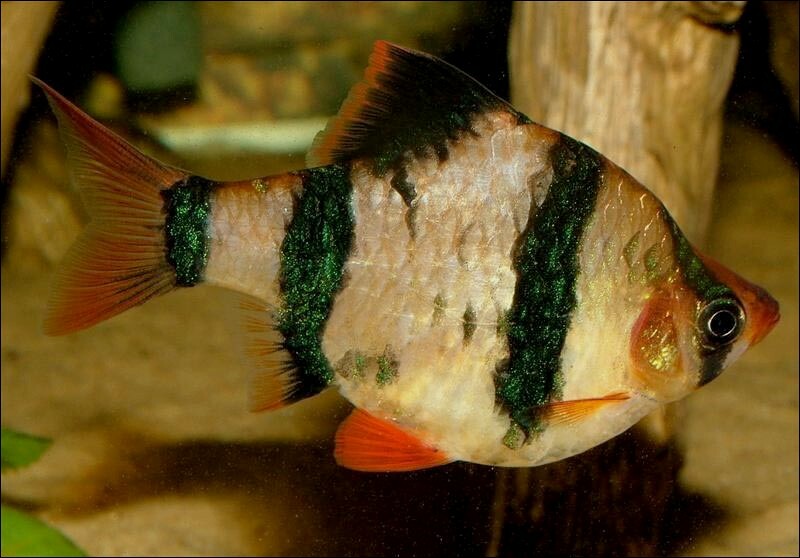 As mentioned in the blog post, the tiger barb does not conform to P. anchisporus either, despite looking very similar—that species has a complete lateral line while the tiger barb does not. If SF were to change the name, what would it be changed to? There is no evidence here, so I can’t see the value in changing a well established name until this gets cleared up. 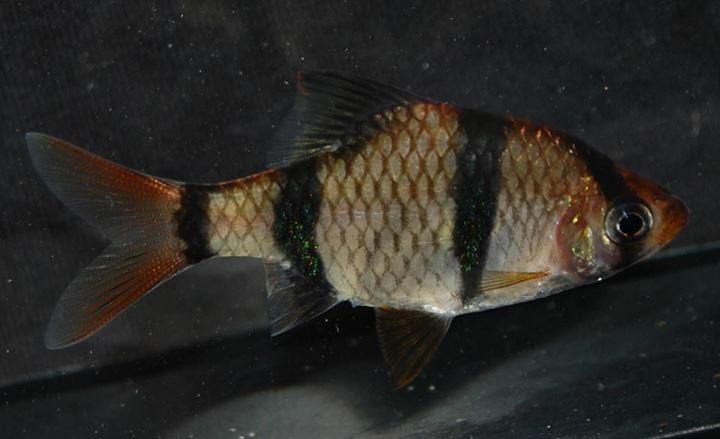 The real P. tetrazona is quite distinct from Anchisporus , Partipentazona and Navjotsodhii , Navjotsodhii does have similar qualities to the fish we see traded as the Tiger Barb ? P.tetrazona has got a look of P. pulcher with it’s dark ventral fins but I’d say it is a more variable fish colour wise than Pulcher and for me Bleekers illustration of Tetrazona is pretty damn good , Steven Grant has pics of a male and Female Tetrazona which he took on a visit to my house ,might be worth using here at SF ! Thanks for the tip and info Andy, will give him a shout. Personally think that both P. anchisporus and P. navjotsodhii show some similarities with the cultivated fish, but who knows!